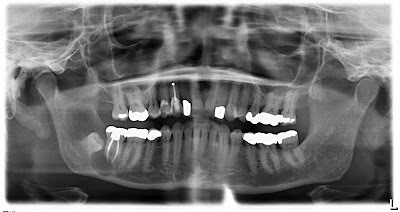 This patient was referred to my office for endodontic evaluation. The patient had a prior RCT with some localized, intermittent pain & swelling. My clinical exam revealed #31 normal to percussion, perio defect on distal >14mm. 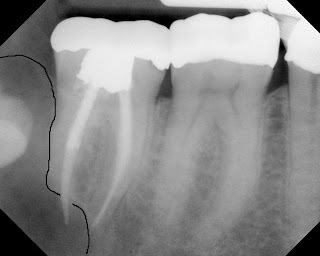 Radigraphs revealed resorption of the distal root, and extensive bone loss on the distal of #31. Due to the strange resorptive pattern and bone loss around the impacted wisdom tooth, the tooth was referred to a surgeon for evaluation. The oral surgeon performed an incisional biopsy with extraction #32. The lesion was diangosed as a dentigerous cyst. Following this diagnosis, the patient was again seen for a excisional biopsy. 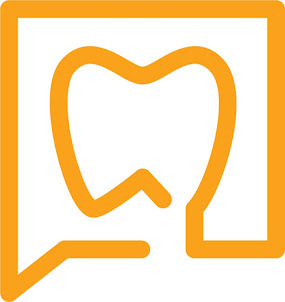 I'm a dental student at UW, aspiring to train in Oral Path. I'm loving your Pathology post, keep it up! The cyst portion is so important because folks can misdiagnose it for and endo/perio lesion. Thanks again!